My Grilling Set-Up – and a Weber giveaway! 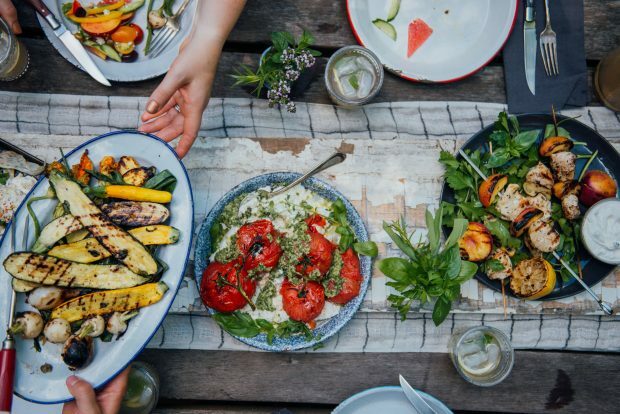 My cooking takes a delicious turn in summer, moving from the Simple Bites kitchen to the backyard patio and the charcoal grill. The patio is shady in the afternoon, and leads onto our sprawling back lawn where the kids play. I love being able to simultaneously grill dinner and jump in on their games, whether we’re tossing a football or slinging a frisbee. When cooking out of doors, fresh herbs are within reach for meals like Sage-Scented Chicken with Grilled Lemon. The overflowing garden inspires dishes such as Grilled Zucchini Salad with Feta-Mint Dressing and Spinach Salad with Grilled Strawberries, Asparagus and Walnuts. 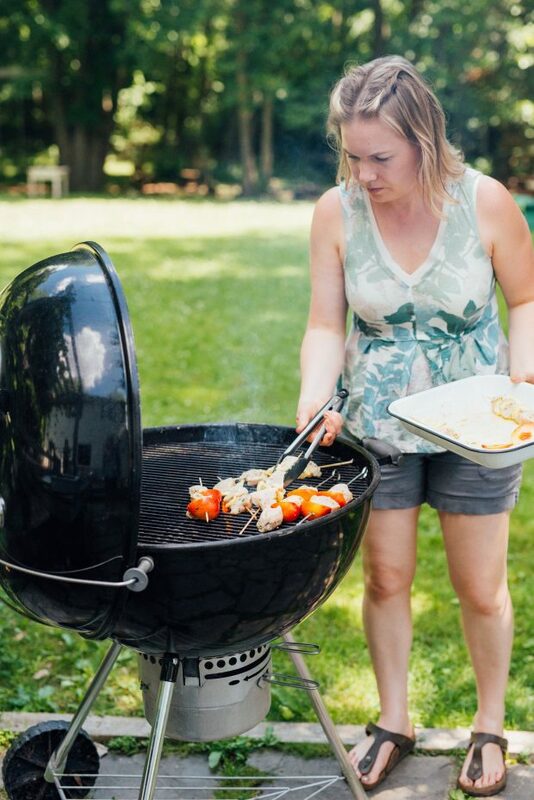 Today, I’m sharing my charcoal grilling set up and the outdoor kitchen space I frequent from May through October. 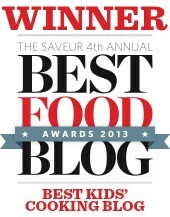 Be sure to read all the way to the end for a Weber giveaway you won’t want to miss. A Weber charcoal grill and a small outdoor workspace are all I use for grilling up a storm all summer long. I’ve seen those impressive outdoor kitchens, with the built in mini fridge and pizza oven, but I like my simple set-up. 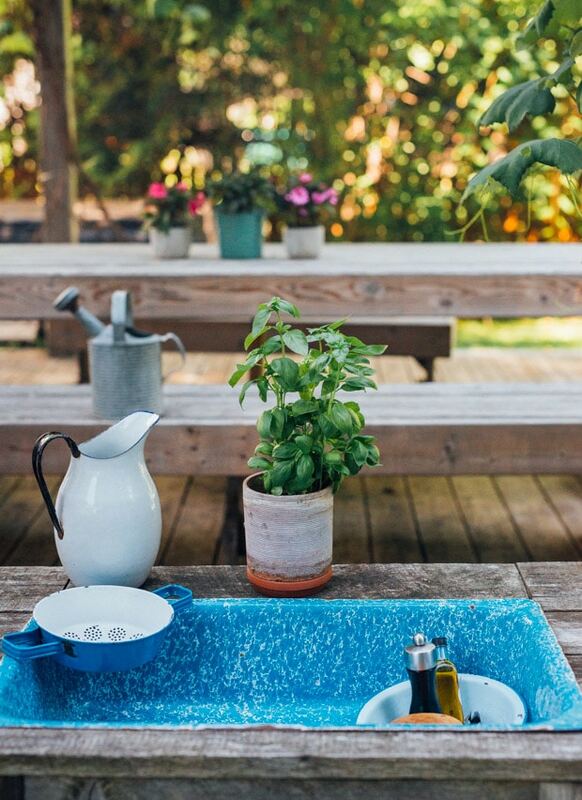 I’ve organized a small outdoor kitchen around a salvaged enamelware sink with a reclaimed barn wood frame (that was a DIY project of summer’s past). It’s a dry sink, meaning it’s not hooked up to plumbing, but it’s still great for washing veg and prep work. 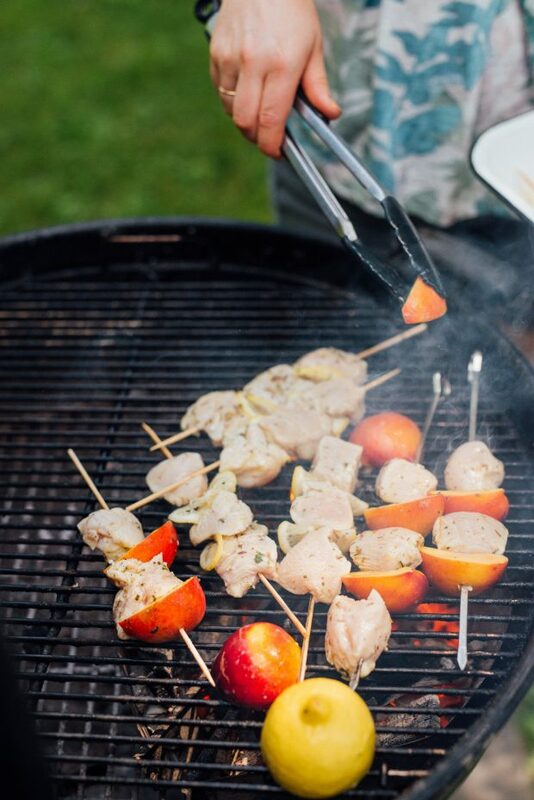 Any small table near the barbecue would work, however, so long as you have a place to set your marinades, seasonings and a few tools. I keep pots of herbs on the sink so I remember to finish my dishes with torn basil or a sprinkling of mint. A few fresh herbs elevates grilled meats and fish, salads and sides, and adds an extra perfume to summer cocktails as well. I’ve tried a few different barbecues and gas grills and find that I am truly happiest when I’m cooking over live fire. 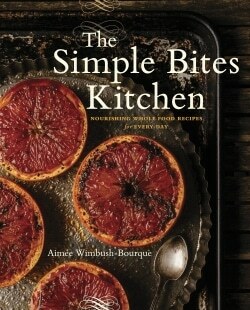 This must stem from my obsession with campfire cooking. The charcoal grill is decidedly more domestic than an open campfire, but requires more effort than turning a knob on a gas grill. Personally, I love puttering around a grill and maneuvering the coals to get the right amount of heat. Grilling extras: Cedar Planks, Metal Skewers, Basting Brush, Meat Thermometer, Premium Grill Cover. These are nice to have, but not essential. The Weber Rapidfire Chimney Starter is really what turns up the heat in a short amount of time. It’s designed to quickly produce hot coals for cooking and is where I start the fire every time. Once the edges of the charcoal start to turn white – and the chimney interior glows red hot – I transfer them into the two char baskets to hold the embers. The chimney also helps me eyeball how much charcoal to use. Filled to the top, it provides enough coals for me to grill an average family meal. 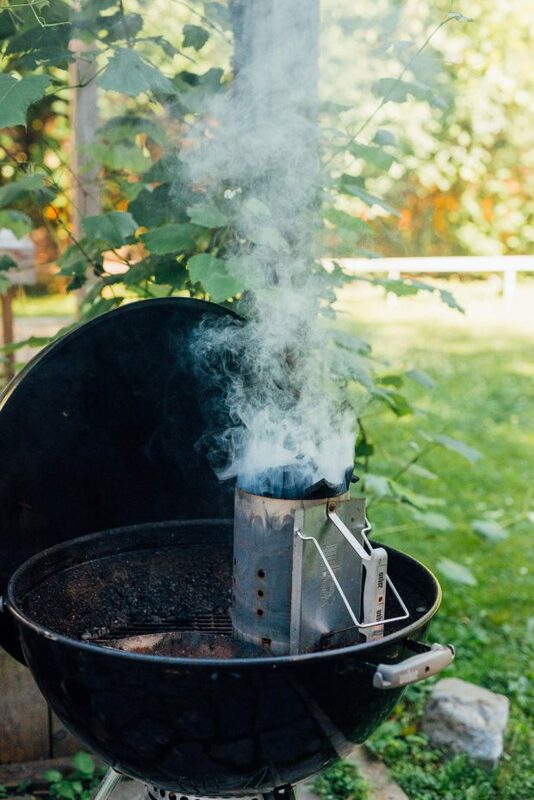 Lump charcoal or briquettes? Hardwood briquettes or Kingsford? This is something you’ll have to play around with to see what you like. 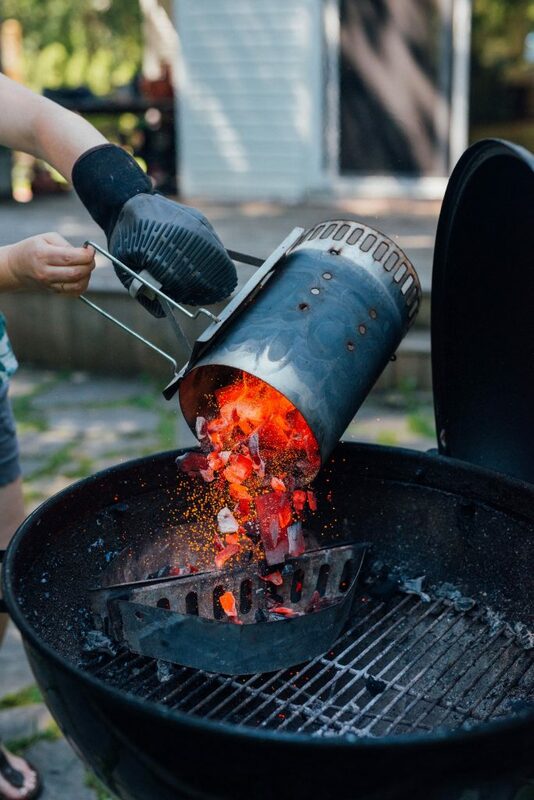 Briquettes do burn longer than lump charcoal, but most of the time I am doing a quick grill (boneless chicken, fish, vegetables…) and don’t need much more than 20 minutes of fire. I use mainly lump charcoal, which gives the food that fantastic clean wood aroma so desirable in live fire grilling. I won’t get into the two-zone fire, measuring heat, tending the coals or any of the other live fire grilling tips and techniques because this post is just about my tools and equipment. Should you wish to learn more, however, I highly recommend Weber’s Charcoal Grilling: The Art of Cooking with Live Fire. Grilling is such serious business, apparently! Really, though, if you want to get serious about grilling over charcoal, leave me a comment and ask your questions. 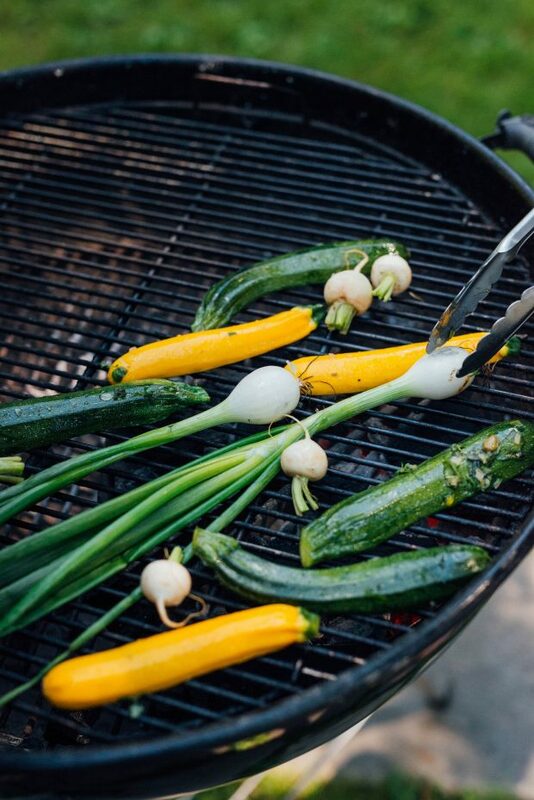 If you like to putter in the kitchen, perhaps with a summer canning project or an epic baking bonanza, chances are you’ll also love perfecting the art of grilling. 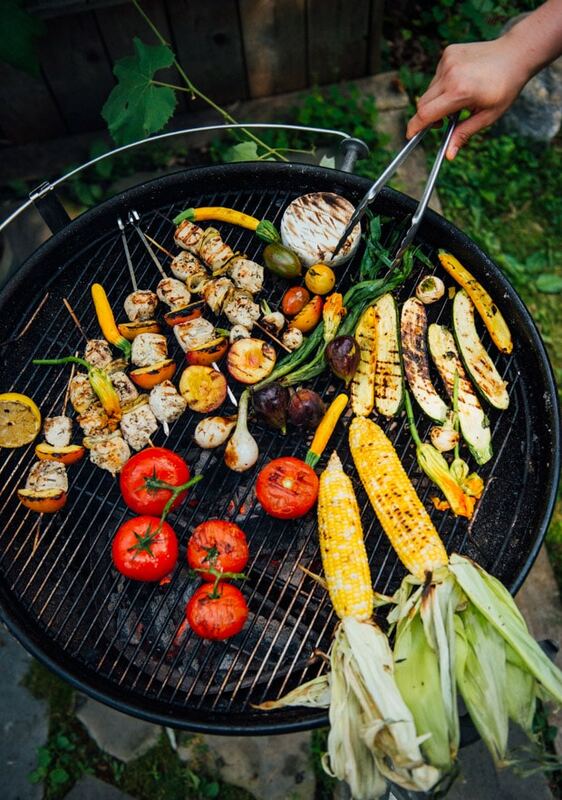 Chicken kebabs, fresh Quebec corn, garden vegetables, and yes, even a wheel of Brie – throw it all on the grill and cook up a feast. 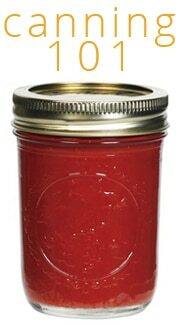 Serve this with a pitcher of sangria or my raspberry rhubarb party punch and you’re all set. The best part of life-fire grilling? When it’s over and we are sitting down around the table with friends, passing platters heaped with simple grilled food. For me, this is the highlight of summertime living. Psst! 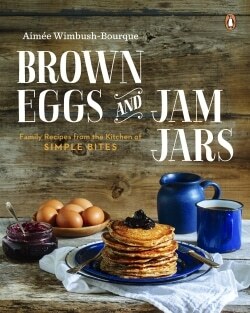 Watch for a few of these recipes to come soon to this space! 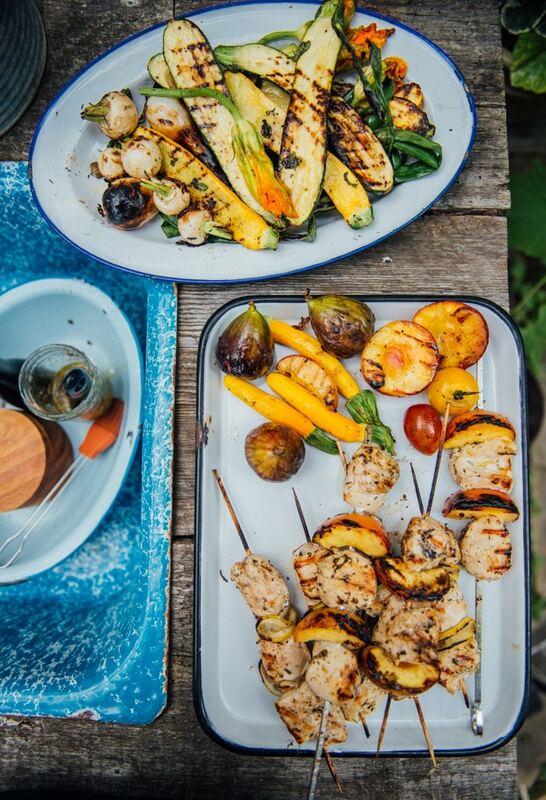 Trust me, I wouldn’t leave you without the recipe for those grilled chicken and peach kebabs. 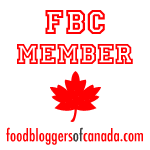 Thanks to my friends at Weber Canada I have an amazing giveaway today for my Canadian readers. 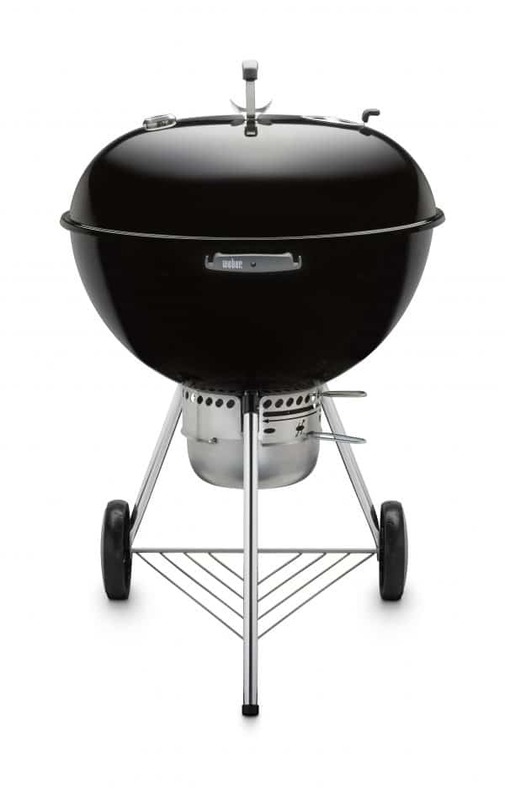 One Canadian will win a Weber Original Kettle Premium Charcoal Grill 22″! It’s exactly what I use, just a wee bit smaller (I rock the 26″) and you are going to love this beauty! Guess what? The winner may pick the colour of the grill – choose between copper, green, crimson and black – and then it will be shipped straight to your door. To Enter: Leave a comment on this post and tell me what is your favourite grilled meal to enjoy during the summer months. 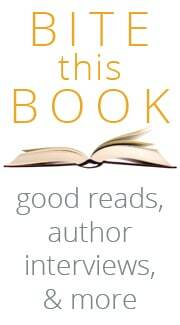 Giveaway ends Tuesday, July 17 at 12PM EST. Winner will be selected at random and announced here on this post.. Giveaway is open to Canadian residents only. Two favourites on the BBQue-back ribs and pizza! That chimney starter looks brilliant! Burgers on the grill are my summer fav! I love to grill steaks and veggies!! Any vegetables (especially asparagus and corn), some wedge potatoes and a sauce of some sort on flatbreads are our summer bbq go-to. I totally agree with you on choice of grills. I lean towards wood charcoal or just plain wood. Maybe because I grew up with my dad using charcoal or maybe because I just LOVE camping..My dream is to finally get a Weber but for now we settle for cheapo grills from Walmart! LOL. Camp cooking is the best part of camping! I love to grill fresh zucchini, peppers, potatoes, corn. And of course steak & salmon. 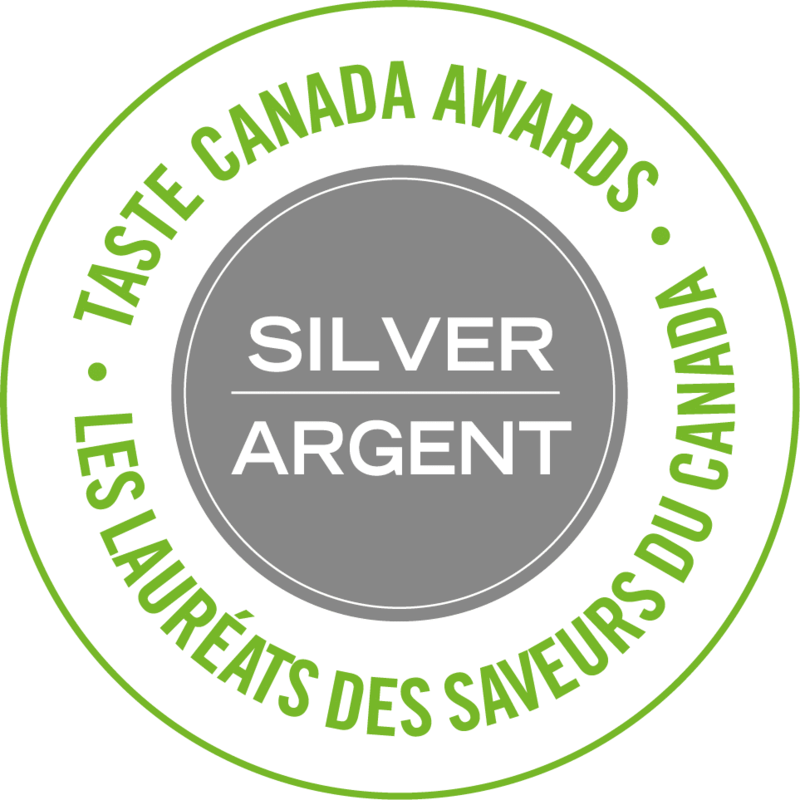 We used to have a “proper” grill (as opposed to a gas grill) – and you’re right, it is the best for flavour. Just like food always tastes better when camping! I have Weber grill and It is the best you can get for grilling! I’m a little upset I missed out on the contest because I absolutely LOVE to grill!